The RIDERSCAN project – scanning tour for motorcycle safety – has just launched its public phase. The project, led by FEMA, is designed to address motorcycle safety issues by collecting information which will, for the first time, allow comparison of situations, fleets, populations and policies between countries and regions across Europe. An online survey which should take approx 20 minutes of your time – click here to launch. A call for contributions whereby you can submit your views (or contribute documentation) on motorcycle safety issues to the project team – click here for details. If you’d prefer to know a bit more about the project before taking part, read on! Project Coordinator: FEMA – www.fema-online.eu – FEMA (of which MAG Ireland is a founding member), is the European federation of national road rider organisations. FEMA represents, defends and promotes motorcycling and the interests of millions of riders across Europe. With 23 national organisations in 17 countries, FEMA is the riders voice at the heart of Europe. The EU Commission, via the 7th Framework Programme for Research. Framework Programmes are the European Union’s main instrument for research funding in Europe and collate all research-related EU initiatives together under a common framework. Mutuelle des Motards – www.amdm.fr – The Motorcyclists’ Mutual Insurance company, founded in 1983, was set up as a reaction to a hike in insurance prices and remains to this day the only mutual insurance company for motorcyclists in France. ACEM – www.acem.eu – ACEM stands for Association des Constructeurs européens de Motocycles, or the Motorcycle Industry in Europe. It is the professional body representing the interests of thirteen motorcycle manufacturers. The specific goals of the project are set out in the following table based on the eight identified headings in the first column. 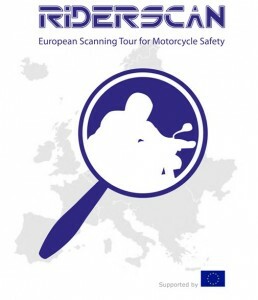 The European Motorcyclists’ Forum on October 3rd at INTERMOT in Cologne, Germany, hosts the launch of the public activities of RIDERSCAN, the European motorcycle safety scanning tour. The RIDERSCAN project is co-funded by the European Union, gathering existing data on motorcycle safety in order to identify missing knowledge and information and provide guidance to road authorities. It brings together all road safety stakeholders involved in motorcycle safety to create a knowledge network, enhancing communication and fostering better cooperation among partners. The launch of the project during the European Motorcyclists Forum at INTERMOT offers a unique opportunity to reach the various members of the motorcycling community: industry, users, and the press. An open Call for Contributions – www.riderscan.eu/contribute – allows anyone with an interest in motorcycle safety to submit relevant information, success stories, data and other achievements. All information submitted will be carefully considered by the project team. A pan-European Survey – www.fema-online.eu/riderscan-survey – aims at mapping the motorcycle community across Europe. This six-month survey will be launched in English, and will soon expand to include most European languages by December 2012. Country-by-country support campaigns in partnership with the major motorcycle media will enlarge the scope of respondents. Moto Magazine (France), MC-Folket (Sweden), and Motorrad (Germany), partners of the RIDERSCAN project, will provide support campaigns for the survey. As a founder member of FEMA, MAG Ireland encourages Irish riders to participate in the RIDERSCAN project because we believe in evidence led policy based on sound publicly available evidence, and not in proposals like mandatory high visibility clothing or an NCT-style test, which are based on opinion rather than hard evidence of necessity.